It's now officially Fall, and I'm so glad! I'm happy be joining a group of lovely bloggers for the "Fall in Love with Your Home" tour. After a long, hot Southern summer, Autumn puts me in the mood to bake. And boy, do I have a wonderful recipe to share with you today. I've long been a fan of Fall baked goods that feature pumpkin, like my favorite pumpkin bread. This year I wanted to broaden my repertoire, so I searched for the very best apple cake I could find. 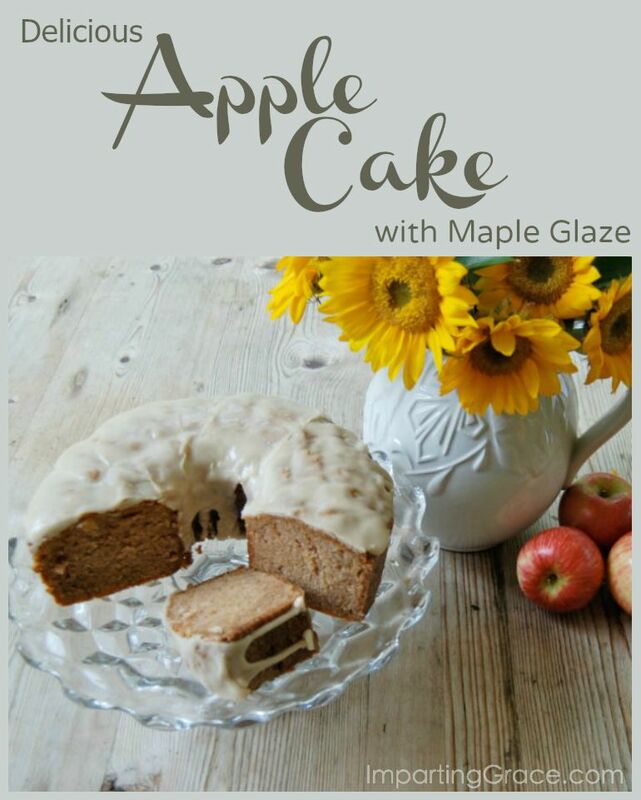 Hands down, the winner is my friend Sheana's Apple Cake with Maple Glaze. The recipe is not difficult or complicated. This is simple, basic baking--with glorious results. Give it a try--you won't be disappointed! To start, preheat your oven to 300 degrees. Yes, you read that right--this cake bakes low and slow. Grease and flour a tube pan. Next, peel and chop several apples, any variety you like. I used Fuji, and I chopped them in my food processor to save time and to avoid big chunks, which I dislike in baked goods, but you chop your apples however you like them. I used three and half apples to end up with three cups of chopped apple. Then mix together 1 cup oil (I use canola), 2 cups sugar, 2 eggs, and 2 teaspoons vanilla extract. Combine in mixer until well blended (1-2 minutes). Blend 1 teaspoon salt, 1 teaspoon baking powder, and 1 teaspoon cinnamon into batter. Add 3 cups chopped apples and 3 cups flour. Mix until well blended. Batter will be very thick, almost like a dough. Spoon batter into prepared pan. Bake at 300 degrees for 60 minutes, then check for doneness. Now, this part is important and requires a bit of attention and patience. You want the cake to be done but not overbaked. Add 3-5 minutes of cooking time and continue to check for doneness each time. My oven required about one hour and 10 minutes of baking time, but all ovens are different. Cake is done when toothpick inserted in center comes out clean. Do not, do not, do not overbake. Remove from oven and cool in pan on a cooling rack. Cool in pan for 10-15 minutes. Use a knife to loosen the edges of the cake before turning out onto a plate. When completely cool, drizzle with maple glaze. To make glaze, sift 1 to 1 1/2 cups of powdered sugar into a microwave-safe dish. Add maple syrup plus one teaspoon maple extract to make a paste. Heat for 30 seconds or so in microwave to make a thin, pourable glaze. Drizzle or pour immediately on cake to desired thickness. Glaze will harden as it cools. As you can see, I like more than just a drizzle of glaze. The maple flavor complements the apple beautifully. Click here for a printable copy of this recipe. Try it! It's easy and absolutely delicious! "Fall In Love With Your Home"
sponsored by The Everyday Home. you "Fall In Love With Your Home." Sounds delicious, Richella! I would love to have a slice to go with my coffee that I'm enjoying right now. I have been looking for a new Fall dessert, and this is just perfect. The maple glaze sounds divine. Thanks for sharing. I am definitely pinning for future use. I love it Richella. Thanks for the recipe, I am enjoying Fall time and recipes. Happy Fall to you and yours. This looks amazing! And perfect for dessert or even as a coffee cake for breakfast!! Mmmmm! I love the combination of maple and apple.. This sounds wonderful! 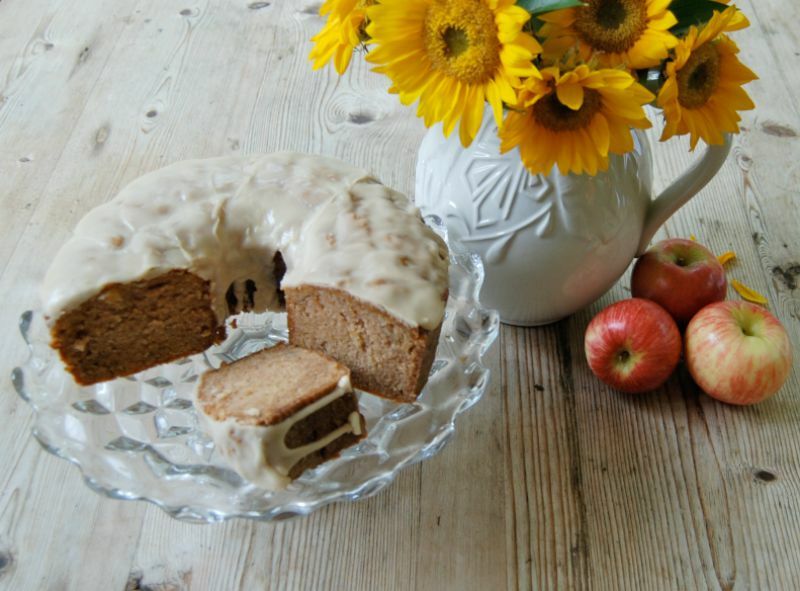 I love a good apple cake in the fall! This one looks great! Thanks for sharing, Happy Fall! Wow, I can taste it already! That looks so good,I am so bummed I can't try it since I gave up sugar. I really enjoyed baking and sugar.Beautiful photos! Oh my goodness, this looks and sounds so good, Richella! I've already pinned it! Your apple cake looks delicious -- I think my family would love it! This looks so yummy, I want a bite with a cup of coffee. LOL, I am going to give this a try for sure. This looks and sounds wonderful! 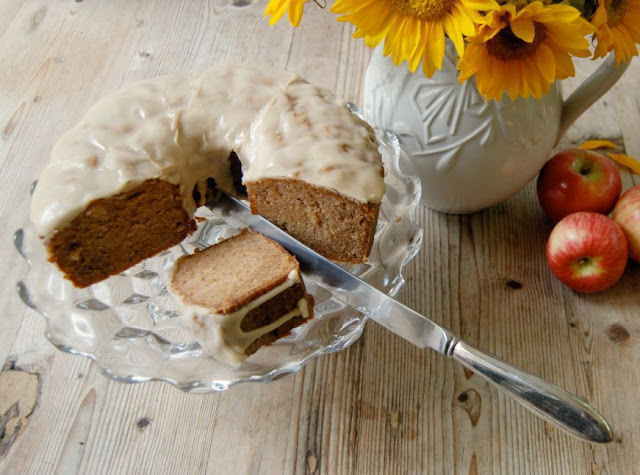 I love apple cake and have a favorite recipe but this one with the glaze is a must try : ) Have a great week. This recipe sounds delicious. I love maple flavor anything! Love the addition of maple flavour - so yummy!